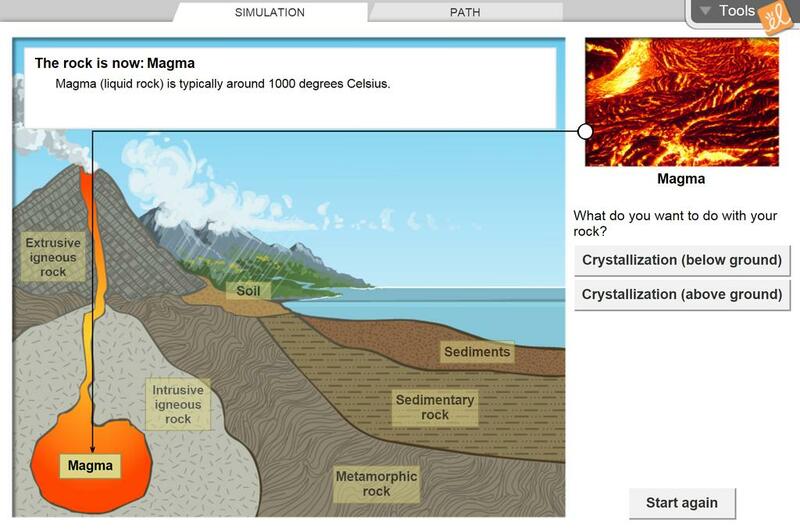 Play the role of a piece of rock moving through the rock cycle. Select a starting location and follow many possible paths throughout the cycle. Learn how rocks are formed, weathered, eroded, and reformed as they move from Earth's surface to locations deep within the crust. Description of the Types of Rock, and Rock Cycle. AWESOME! Modified for different leaarning styles, and m... (more)odification for variety of learners on a lesson plans. Great exploration for concepts of the rock cycle processes. Good to teach erosion, deposition, sediment and soil for 4th( but don't use the given resources for rock cycle). The resources in the lesson plan really rock the cycle. excellent illustration of the never-ending flow of materials through the rock cycle. My student's loved their 1st Gizmo! Excellent connection for the rock cycle! Making the subject very accessible to the students. Very good review tool. My students loved this one!